Why are we asking the fox to watch the ABIM/ABMS henhouse? In November 2016, practicing physicians passed a resolution 607 at the AMA House of Delegates meeting requesting an independent audit of the ABIM. As my prior post disclosed, the AMA is heavily vested in the ABMS MOC program as a member organization of the ACGME. The response from the ABIM's corporate communications department was entirely predictable: see the ABIM website. This is not an independent audit. Would the ABIM like to explain why they changed auditors? We want to know for ourselves why there is a $13M shortfall this year. Might their investments in the Caymans have fallen short? Did they move those assets offshore to avoid potential tax consequences? 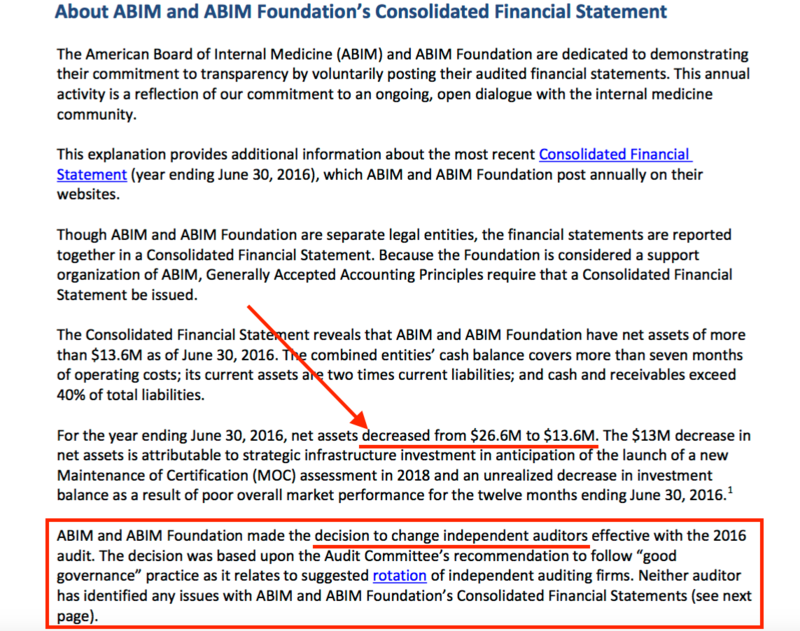 Might they have made a few not-so-tiny errors on their behelf, like covering up the existence of the ABIM Foundation for 10 years and using $76M of our testing fees to create the ABIM Foundation by falsifying tax records? There are a lot of questions to be answered. Why did the ABIM remove their website from the internet archive in 2014 if they were not trying to cover up their activities? Why wouldn't they release their tax forms to main stream media outlets when asked in 2013-2014, and why was the request for those documents only made available via the PA governor's press secretary? No, the AMA can't bury this one. Either they will hire an independent auditor approved by practicing physicians in America to review tax records from 1990 through the present, or we will be sure to ask the IRS and DOJ to join the investigation on our behalf. Practicing physicians in America want the truth. All of it. And we will not rest until the activities performed by the ABIM with our finances withstand independent public scrutiny. I attended the University of California, San Francisco's (UCSF) electrophysiology program from 1993-1994. As I continue to explore the myriad of conflicts of interest inherent to the American Board of Medical Specialties (ABMS) Maintenance of Certification (MOC) program, it has come as quite a surprise to me that so many members of my alma mater (and the institution itself) were either passive or active participants in the strongman tactics used by the American Board of Internal Medicine (ABIM) as a "message and deterrent" (as explained by former President and CEO of the ABIM, Christine Cassel, MD) to control the ABIM/ABMS monopoly on continuing medical education in the United States. 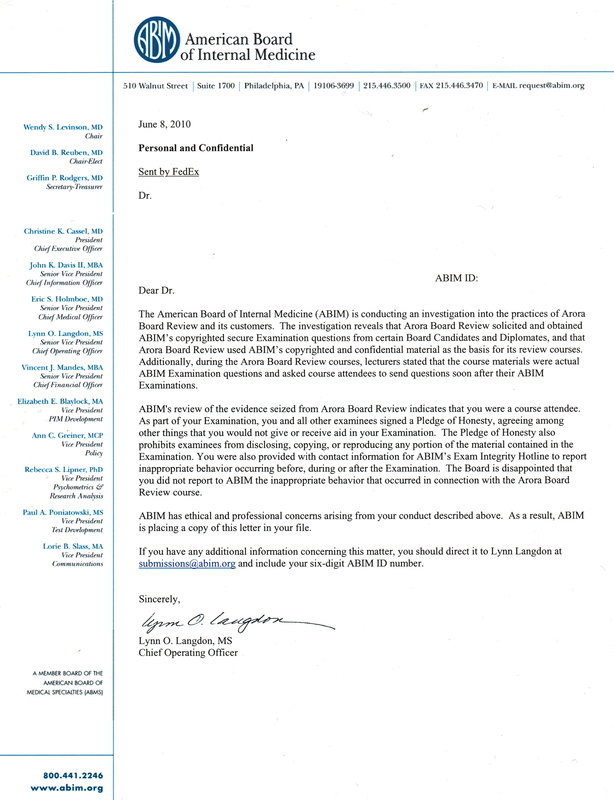 In a retaliatory letter dated May 8, 2012, authored by Ms. Lynn Landon, the non-physician Chief Operating Officer of the ABIM at the time, Jaime Salas-Rushford, MD was accused of forwarding, prior to ever taking the ABIM Board certification exam, board review questions to the ABIM-certified instructor of the CME-accredited Arora Board Review course. About three years after the fact and after 139 others had already been sued or sanctioned for attending the same course (or at the very least, like a flashback to the McCarthy era, had warning letters "added to their file") this retaliatory letter declared that ABIM imposed an immediate, unlimited revocation of Board certification of Dr. Sala-Rushford and to "notify the Medical Board in every jurisdiction in which you are licensed" without due process. On the stationary sidebar of that letter appear the names of the officers of the ABIM and it’s board members at the time: Chair Catherine R Lucey, MD, Chair-Elect Robert M Wachter, MD, Secretary-Treasurer Talmadge E King, MD, and President and CEO Christine Cassel, MD among others. Were these leaders listed in the sidebar mere figureheads of the ABIM when this occurred or were they ultimately responsible for the organizations' actions as their positions suggest? Dr. Lucey serves as an at-large board member of the American Board of Medical Specialties 2016-2017 and on the Board of Directors of the of the Association of American Medical Colleges (AAMC). Dr. King has a long history of serving on the Board of Directors of the National Committee for Quality Assurance (NCQA) from 2010-2017 as an unpaid board member and currently works alongside the organization’s founder and President, Ms. Margaret E. O’Kane. Remember that NCQA, under Ms. O'Kane's direction, developed, maintained, and expanded the Healthcare Effectiveness Data and Information Set (HEDIS), the nation's most widely used quality measurement tool and has grown to a $50 million company with almost 300 employees. NCQA is also the main accreditor of recognized medical homes and one of two accrediting organizations permitted by federal law to accredit plans in the new health insurance exchange marketplaces that came online October 1, 2010, under the Affordable Care Act (ACA). Because the NCQA also credentials insurance providers as part of the ACA, one insurer quality metric they created requires physicians to "maintain" their certification via ABMS MOC programs if they want to receive payments from those insurers. Furthermore, the NCQA and the ABMS will continue to directly benefit from "quality" rules that they have put into place and lobbied Congress to enact laws such as the Medicare Access and CHIP Reauthorization Act of 2015 (MACRA). MACRA's Merit-based Incentive Performance is MOC on steroids (see comments to the final rule). While NCQA maintains the quality measurement tool that is used in MACRA to determine US physician pay based on their notion of care "value," much of the NCQA's own IRS 2015 Form 990 is redacted. Who is protecting our patients' interests when even the IRS allows this to occur? Dr. Wachter has his own financial conflicts with MOC that also benefitted the UCSF. 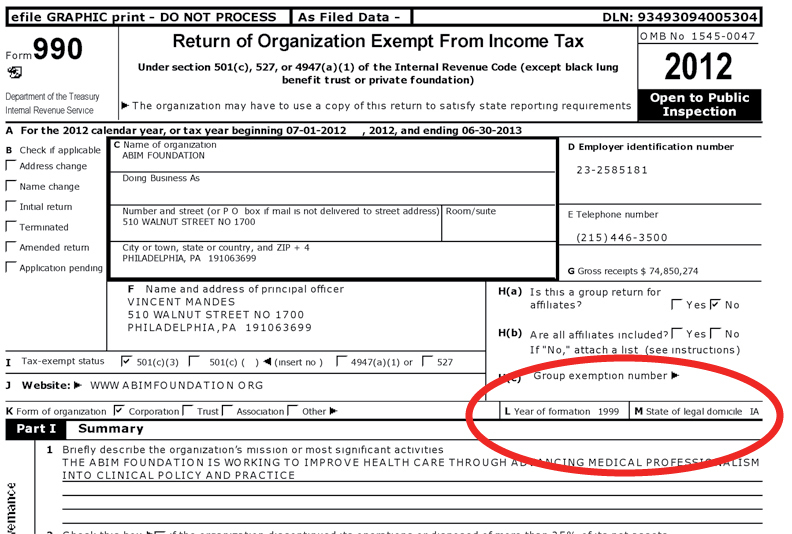 According to IRS Form 990's, in 2012 when the above sanction letter was issued, Dr. Wachter served as 'Director-Chair" of the ABIM earning $38,888 from the ABIM and $6,626 from the ABIM Foundation. While serving as "Director-Chair" of the ABIM and Director of the ABIM Foundation, Dr. Wachter was also simultaneously serving as Director of the IPC The Hospitalist Company, Inc, reportedly running a “leadership development course (at UCSF) for their practice group leaders.” Dr. Wachter's financial haul from his relationship with IPC was significant. He pocketed 1,355 shares of IPC stock valued at $50.68 on 1 Aug 2013 and another 2650 shares of stock valued at $58.50 on 2 January 2014. According to SEC filings, he earned $210,586 in 2014 ($ 108,000 as cash, $ 55,000 in stock and $ 47,526 in options). USCF benefitted from a fellowship grant with IPC brokered by Dr. Wachter that began sometime in 2010 or 2011 (Dr. Wachter's description of the program was published on his blog 18 November 2011.) On 17 June 2014, the Department of Justice filed suit against IPC Hospitalist Company alleging the company overbilled federal health insurance systems for physician evaluation and services. Nonetheless, it appears Dr. Wachter still received a stock option award of 2186 shares of IPC on 2 Jan 2015. Undeterred by the DOJ suit (or perhaps because of it), TeamHealth acquired IPC Hospitalist Company for hefty $80.25 per share on 23 Nov 2015, again profiting Dr. Wachter and UCSF (with whom he had a publicly-disclosed sharing agreement where he kept 80% and UCSF received 20% of this relationship). As of 17 Jan 2017, it appears a settlement agreement in the DOJ's suit against IPC The Hospitalist Company will be reached soon. In retrospect, watching Dr. Wachter doing an Elvis impersonation at Mandalay Casino in Las Vegas on behalf of corporate medicine at patients' expense with the tacit approval of the Dean of the UCSF Medical School reflects poorly on the University. These activities also serve to erode any remaining trust practicing physicians have on the unproven ABMS MOC program to serve in our patients' best interest. It is remarkably coincidental that on 27 December 2012, an article appeared in the New England Journal of Medicine by one of Wachter’s colleagues at UCSF, Robert B. Baron, MD written in conjunction with John Iglehart, a “national correspondent” for the New England Journal of Medicine, explaining the controversy surrounding MOC and reinforcing the need for it. Dr. Robert Baron (no relation to Richard Baron, MD of the ABIM) never disclosed his simultaneous collegial associations with so many in leadership positions of the ABIM at the time, nor did either author mention the fact that the "NEJM Group" would be announced in March, 2013 to profit the Massachusetts Medical Society that included the launch of their Knowledge+ Maintenance of Certification “state-of-the-art adaptive learning” educational product April 16, 2014.
Who wouldn't want to join such a financial and reputational party bestowed upon these former ABIM leadership physicians? What medical center wouldn't like to benefit from the ABMS MOC system so many from UCSF have? How many other institutions are? Given what we now know about these colluding private organizations and their ethical and financial tactics, why haven't these respected leaders come forward to denounce the activities of the ABIM for which they served? Perhaps these leaders are fearful UCSF would lose their ACGME accreditation as a teaching institution eligible for additional Medicare training funds if they did. Or perhaps these individuals saw little risk of collateral damage to their professional reputation if ABIM used its strongman tactics against a small number of vulnerable, less prominent physician colleagues. The irony of the ABIM requiring doctor clients of Arora Board Review subject to the sting operation organized by an undisclosed convicted felon to participate in “ethics” courses and pay additional fees to the ABIM before their board certification credential could be reinstated should be lost on no one. According to USCF's own Faculty Code of Conduct: "The integrity of the faculty-student relationship is the foundation of the University’s educational mission. This relationship vests considerable trust in the faculty member, who, in turn, bears authority and accountability as mentor, educator, and evaluator. The unequal institutional power inherent in this relationship heightens the vulnerability of the student and the potential for coercion. The pedagogical relationship between faculty member and student must be protected from influences or activities that can interfere with learning consistent with the goals and ideals of the University." I would argue that the unequal institutional power carried by the ABIM (and other ABMS member boards) that can revoke a physician's ability to practice or earn a living on the basis of an unproven repeated testing is even larger and warrants even greater scrutiny. It is clear that the complex financial interrelations of many tax-exempt private organizations that require the ABMS MOC credential have developed over the years to monopolize the physician continuing education process. In my opinion, it is far too coincidental that all of these physicians a single institution just happened to hold unelected leadership positions in so many of these interrelated private entities that financially benefit from MOC at the same time. I also believe the fact that another physician from the same institution published a manuscript in the New England Journal of Medicine while his colleagues stood to benefit politically and financially from their positions gives the appearance of collusion. I believe the UC Board of Regents, Attorney General of California, and/or even the Governor of California have a responsibility to investigate the use of public monies and academic positions to benefit these many non-governmental private entities that act outside of University responsibilities and act, as one independent journalist described them, "more akin to a protection racquet." The ABMS Maintenance of Certification controversy and those culpable for its strongman tactics extends far further than just the ABIM. When respected leaders of the academic community fail to speak out about the irresponsible activities that occurred during their tenure with the organization, I believe they passively condone them. I suspect this is why we have heard little from other members of the academic community since the collusion extends to current board members of the NCQA, AAMC, ABMS, the New England Journal of Medicine, and other prominent academic institutions like UCSF. Practicing US physicians voted to end the ABMS MOC program before the AMA House of Delegates meeting in June 2016 because of the unexplained financial dealings and the strongman tactics employed by the organization, yet it continues, even now. This no longer surprises us since the AMA is a member organization of the ACGME, too. How high do the conflicts go in the US medical education system? It is now clear they go all the way to the top. It is also clear why. It's time for the AMA to shut the ABMS MOC program down as practicing US physicians have voted because it's doing more harm than good, not only to reputable practicing US physicians nationwide, but to their patients and academic institutions (like my alma mater) that purport to train and educate physicians to become ethical, hard-working, trustworthy doctors without fear of reprisal for educating themselves any way they choose. Disclaimer: I serve as an expert witness on behalf of Jaime Salas-Rushford, MD. Will Fraud Investigators Read the New England Journal of Medicine? The Office of the Inspector General of the Department of Health and Human Services took great pride in publishing a video at the end of 2016 heralding all their accomplishments for the year. The OIG of HHS should consider reviewing the comments section (pdf of comments here) in response to the American Board of Internal Medicine (ABIM) promotional article by Richard Baron, MD and Clarence H. Braddock, III, MD in the New England Journal of Medicine to start their year off with a bang when seeking to root out sources of waste, fraud, and abuse in the US healthcare system. There should also be a full investigation of the research protocols and informed consent used by the ABIM to conduct research on physicians "to improve US healthcare" and the security measures employed to protect the integrity of the data they collected on physicians. Sending survey results over a non-secure website link (http://survey.abim.org) hardly satisfies even the most minimal data security requirements to protect the information submitted on physicians! Physicians want (and deserve) answers about this corrupt program and they want it to end, not modified or "improved." Until the ACGME, NCQA, AMA, AAMC, and each of the 24-member boards of the ABMS understands this and takes meaningful action to end this monopoly on our continuing educational system, pressure by practicing physicians to force an end to MOC will continue.